The Best Budget Web Hosting Award is presented to the web host that provides first-rate web hosting services for less than what comparable hosts charge. Fierce competition amongst web hosting companies has resulted in an industry in which asterisked pricing has become the all too common norm. Almost invariably, the asterisk indicates that the price displayed is for the initial term only, and that “standard rates” will apply once the initial term has expired. At NCM Online, we believe that the true cost of web hosting must be measured over time. Therefore, we use renewal pricing to compare hosting service costs. Unfortunately, renewal pricing is not always readily available. We have reviewed hosts that do display renewal rates until you have already begun the checkout process. Others bury the renewal rates within lengthy “Terms of Service” agreements. Some only provide renewal pricing to customers via the hosting dashboard. In a world filled with less-than-transparent business practices, the web hosting industry must certainly be considered one of the least consumer friendly. However, not all web hosts stoop to such sleight of hand. At HostNine, the price you see is the price you pay. No asterisks required. As we know, price is only one measure of a good host. We are pleased to report that HostNine garnered perfect 5-star ratings for ease-of-use, disk space, bandwidth, uptime, support, and satisfaction. Further, of the 50 popular web hosts tested, HostNine ranked #4 in worldwide page-load speed. 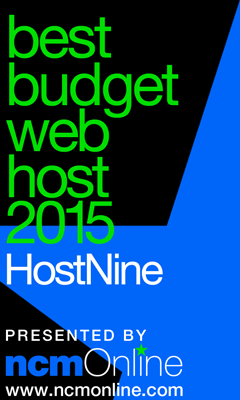 NCM Online is proud to present its Best Budget Web Hosting Award for 2015 to HostNine.